Now that the weather is finally getting warmer you may be planning to go camping. What better book to bring with you then something suspenseful. If you are looking for something slightly spooky, but not the typical horror fare here are two uncanny stories about haunted houses with a twist. 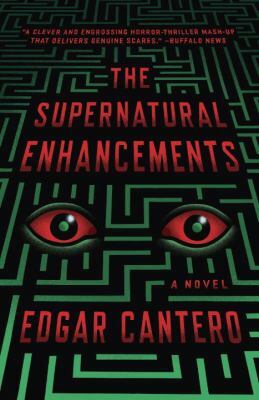 The Supernatural Enhancements, by Edgar Cantero. Edgar Cantero was born in Barcelona and this is first novel written in English. I read The Supernatural Enhancements during the week leading up to Halloween last year. It has spooky elements of horror, but contains so much more. The Supernatural Enhancements refers to the unusual attributes of Axton House, inherited by the Irish protagonist of the novel A. from a distant wealthy relative living in Virginia. The novel unfolds in a variety of ephemera that were collected during A.’s inhabitance of the house along with his younger, mute punk companion, Niamh; these include entries from dream journals, letters, advertisements, transcripts of security video footage and more. Fans of more traditionally structured works may find the structure of The Supernatural Enhancements frustrating, but I was charmed by Cantero’s quirky sensibilities. Since the novel is told through scraps of different things it has the added mystery of things that are hinted at but not said. The Supernatural Enhancements is compelling enough that it could have been told without the unusual format, but I felt due to the nature of the tale it felt well suited to it and it kept the structure from feeling purely gimmicky. The title and format immediately put me in mind of the found footage horror movies such as Paranormal Activity. Part One of the book seems like a classic haunted house tale where the foolish inhabitants are more curious than afraid of the ghost, however, as the novel progresses it turns into a much more complex and unusual tale. I was surprised by, but happy with the direction the novel took in the end. The Hawley Book of the Dead, by Chrysler Szarlan. The Hawley Book of the Dead is Chrysler Szarlan’s first novel, and the beginning of a quartet of books. Like The Supernatural Enhancements, it takes the idea of a haunted house and magic and takes it in unexpected directions. This book’s ominous title seemed like the perfect choice for this past March’s Friday the 13. However, it is more akin to Deborah Harkness’s Discovery of Witches than a horror novel. The Hawley Book of the Dead is the story of Reve (Revelation) Dyer, a magician along the lines of Criss Angel. I liked how Szarlan used her own experience as a magician’s assistant in the creation of the book. Reve and her husband live happily in Vegas where they perform together and raise their three daughters. But one night Reve shoots her husband on stage with a gun that should have contained only blanks, which leads her to realize that she is being stalked. She flees across country to Hawley Five Corners, an old New England town that her family helped found and the locals believe is haunted. Reve (whose nickname is the French word for dream) and her daughter have nightmares that seem to be portents. All the women in Reve’s family have unusual abilities such as healing or her ability to disappear. 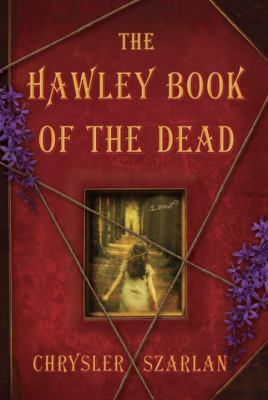 The Hawley Book of the Dead is mostly told from Reve’s point of view, but also includes chapters of third person narration about her youngest daughter, and texts sent between her two teenaged twins. I found The Hawley Book of the Dead hard to put down and found myself always wanting to read just one more chapter before I went to bed. The novel feels self-contained in that it has a satisfying ending, but there are several subplots that seem likely to pop up in future novels, which I’m looking forward to checking out.